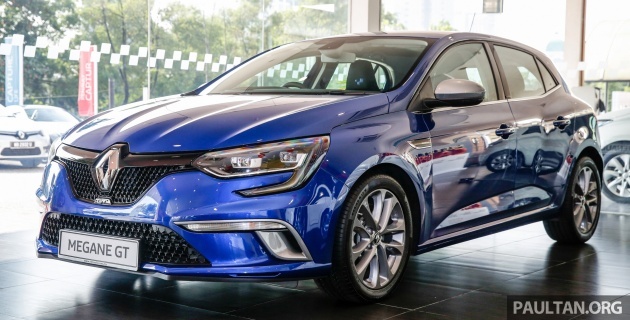 First previewed back in November last year, the fourth-generation Renault Megane now appears to be on sale in Malaysia, priced at RM228,000 on-the-road without insurance. 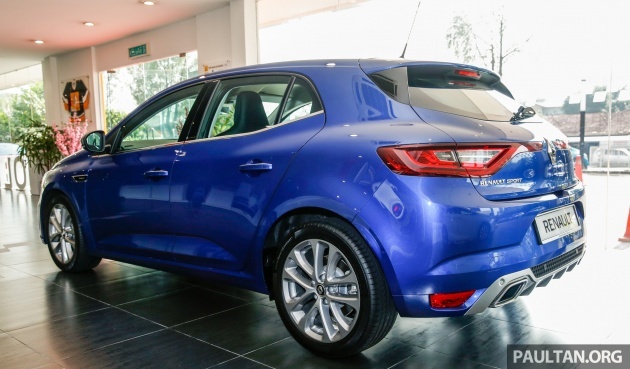 Seen here at TC Euro Cars’ PJ showroom is a non-RS model – the Megane GT wearing an Iron Blue finish. Under the bonnet is a 1.6 litre turbocharged four-cylinder engine offering 205 PS at 6,000 rpm and 280 Nm from 2,400 rpm. The Energy TCe 205 mill is paired with a seven-speed wet Efficient Dual Clutch (EDC) automatic transmission, and will get the GT from zero to 100 km/h in 7.1 seconds. The top speed is 230 km/h. While the GT may not be a full-on RS model, the company’s performance division did lay a hand in the development of its chassis and suspension. The car’s Multi-Sense system also offers five driving modes, with the Eco mode being replaced with an R.S. Drive mode. Other driving-related bits include 4Control four-wheel steering and Multi Change Down, the latter allowing for rapid downshifting on the EDC transmission as well as launch control. The GT rides on gunmetal 17-inch alloy wheels with 225/45 profile tyres. For the GT to stand out from a regular Megane IV, there are more aggressive bumpers front and rear, a rear diffuser with dual chrome exhaust exits, darker exterior accents and some GT and Renault Sport badging. On the inside, you’ll find more GT badges to go along with the black/blue upholstery, satin-finish chrome accents, leather-wrapped steering wheel and aluminium paddle shifters. Also fitted are R.S. front sport seats with integrated headrests and dedicated door sills. In terms of equipment, the car comes with Pure Vision full LED auto headlamps, LED tail lights, signature LED daytime running lights and automatic wipers. For infotainment, there’s a seven-inch R-Link 2 system, which works with an eight-speaker Arkamys 3D sound system. Other items include dual-zone climate control, a seven-inch instrument panel display, aluminium pedals and reverse camera. Safety-wise, the GT comes with ESC, traction control, ABS, EBD, EBA and hill start assist as standard. Also present are six airbags (dual front, side and curtain) and four rear parking sensors. The price tag mentioned at the start also includes a three-year/100,000 km warranty. Should you want to tag on some accessories, four tinting options are available from Raytech and V-Kool, priced from RM1,049 to RM4,436 (inclusive of GST), plus there’s also a trunk tray for RM200. Nobody will buy. then they will Drop Prices. Same like Fluence. Last time price high. Now jatuh to RM89k. After bargain and discounts, become RM80k for a brand new Fluence. This car will be the same. Next year sure buang price at RM100k. So ur getting the cheap car that u constantly demanded. Why u no puji! TC Euro should also introduce the entry level sedan version. This is the bread and butter model. Someone said French LHD to RHD conversion not lazy one. Handbrake at left side is considered natural one. Impractical glove compartment is considered okay one. What? Shouldn’t that price get a Megane RS instead of this? 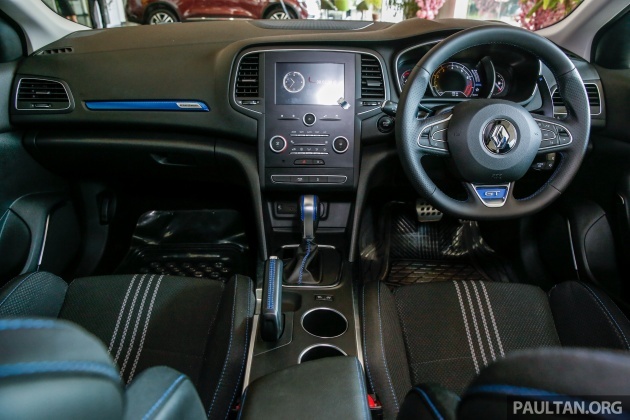 The LCD looks so cheapo and interior so dated this car doesn’t worth more than RM200k for sure. They cud have replace it with something like Volvo’s verticle ipad touchscreen radio/aircon controller. Not exactly sure for who this car is for… . Mercedes A200 is worst by the slow response and under power engine, no performance at all. Just wasting money of buying such brand only, Megane is a real car!!!! Wow, price remain the same as in 2014 but downgraded to 1.6L turbo instead of previous legendary 2.0L turbo. No Renault we will not accept this downgrade. It’s a very good car and in such 1.6L turbocharged engine giving the most powerful performance that needs for every drivers. Instead of this GT, would like to select the real Megane RS even the price will a bit higher!! RM200K+ for 1.6 turbo is not worth. at least give 2.0 turbo. And for Europe, they gave electronic parking brake. Have u checked glove compartment space? Can take photo it inside? This model is in Golf GTi territory. Can’t compare to Civic 1.5 turbo nor Type R. Btw, should include the 8.0 inch head unit system like the one in Koleos lah. Well, lets wait for VPCM response. This segment is going to be very interesting. Just top up a bit lah and get the Bugatti Chiron. What a shocking price. Bloody ugly…. With 228k price tag…. from the price we cannot determine no people will buy it.. u will buy it because you are fans or diehard love of renault megane … you will see it OTR too… but lets wait for megane RS price reveal..
1.6 the spec that price!I would say good luck. 228k with that kind of centre cockpit design? You gotta be kidding me. For RS, only rm197,888 but this GT rm220k? I will only consider this car if price below rm180k. Volvo V40 T5 only rm190k, sprint time only 6.3sec. I personally like this car, even though interior could be much better, but at this price tag, it must be a joke!